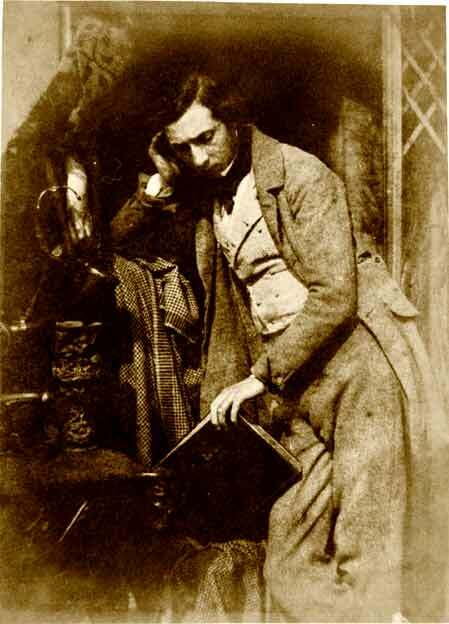 The Scottish painter and arts activist David Octavius Hill formed Hill & Adamson studio with the engineer and photographer Robert Adamson between 1843 and 1847 to pioneer many aspects of photography in Scotland. Amongst their subjects were a few that have particular relevance to the history of photography and photographic societies in Edinburgh. I have collected Hill and Adamson’s ‘portraits of photographers’ together in this post, along with some other contemporary portraits/self-portraits of photographers also made in Calotype. My intention is to produce a series of modern pinhole self portraits emulating the poses in these ten portraits. This will be the next stage of my investigation into the effects of long exposures on the pose of the portrait subject. I have given a literal description of each of the portraits below in preparation for my own photographic work. My apologies to those reading this post if it is just too boring. The first portrait is of Hill himself. Hill is pictured in a doorway. He is shown frontally at 3/4 length. He leaning on the side of a door with a doorbell to his left at shoulder height. His right arm is straight by his side holding a hat. His right arm is across his stomach at waist level with his fingers bent. His head is erect and is turned slightly to his left. His eyes are averted to his left. His expression is neutral. He is wearing a suit, waistcoat, white shirt and a ruffled cravat. The doorpost to his left is in focus the background behind and to his right is blurred. The light is from the right of the frame putting one side of his face slightly in shadow. David Octavius Hill standing at the gate to his studio, Rock House, on the stairs leading up to Calton Hill – a calotype by Hill & Adamson. 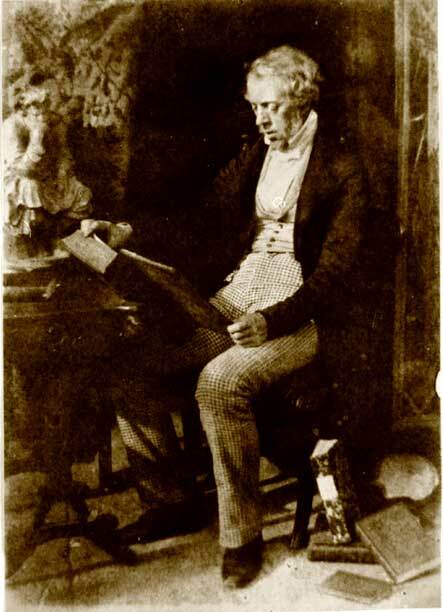 The second portrait is of Robert Adamson, Hill’s photographic partner. Adamson is standing with his body at 3/4 view facing to his left. His head is in profile also facing to his left. His expression is neutral/thoughtful. The portrait is half length. His arms are bent and he is holding a book. The index finger of his right hand appears to be acting as a book mark as it is inserted into the leaves of the book. The fingers of his left hand are resting on the outside book cover with his thumb pointing upwards. He is dressed in a suit and waistcoat and is wearing a cravat. The coat sleeves appear to be folded back and his jacket has a darker collar, possibly of velvet. The lighting is even, if at all it is from the right of the frame. In front of Adamson to the right of the frame, there is a floral patterned curtain at the top and what looks like the side of a metal barrel at the bottom – possibly some form of milk crate? The next portrait is of Sir David Brewster. He founded the St Andrews Literary and Philosophical Society in 1838. It was primarily through this society that Brewster and a small group of pioneering photographers, including the Adamson brothers and Thomas Rodger experimented with the calotype process in the early 1840s in St Andrews. Brewster is pictured frontally seated. He is looking down reading a book. His body is turned slightly to his left. The portrait is 3/4 length. The lighting is flat and is probably frontal. His right hand is holding the book which appears to be balanced on the left arm of a chair. His left hand is resting on the book. The chair has a patterned fabric on the back, which is quite high reaching above Brewster’s shoulder. To his right there is a table which reaches to the height of his hands. The table is shiny with carved legs and top. On the table there is a piece of decorative silverware. 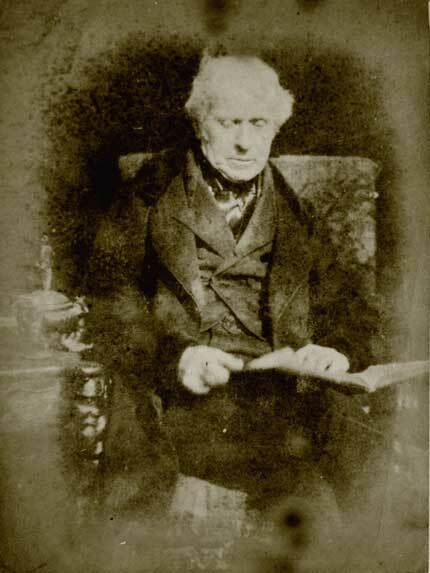 Sir David Brewster – the Photograph above is a calotype taken by Hill & Adamson between 1843 and 1847. 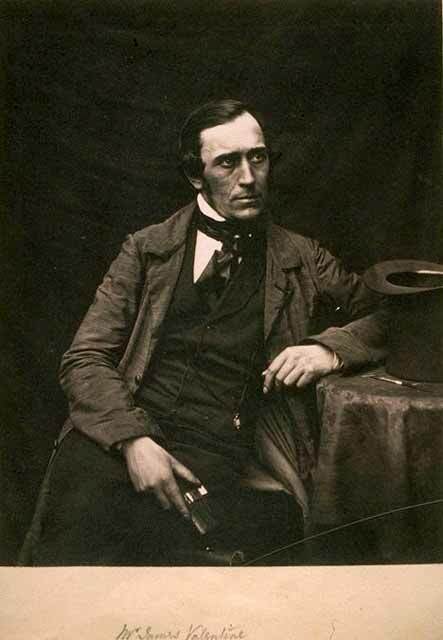 Next we have John Cay, who was Sheriff of Linlithgow and was a member of the Photographic Society of Scotland. 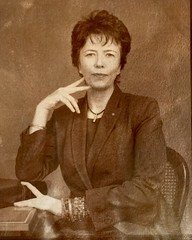 Cay is seated at a desk, looking down to the right of the frame reading. A large book is resting in his lap with the cover also resting on the desk. He is looking down reading the book. The portrait is full length and three quarter view. He is wearing a dark coat, with a pale coloured short waistcoat and a white shirt and bowtie. His trousers are of a check pattern with turn-ups. His shoes are slightly pointed. The overall impression of his clothing is somewhat dapper. On the desk to the left of the frame there is a statue of a figure seated with its right elbow resting on its right knee and head resting on the hand. The figure is reminiscent of the pose of Rodin’s ‘The Thinker’. Above the desk there seems to be a curtain. Behind Cay there seems to be an alcove which is very dark. The the right of the frame there is the edge of what looks like a wooden screen and at his feet there are several books lying untidily. There is also another object which I cannot make out. The light seems to be coming from the left of the frame with the left side of Cay’s face slightly in shadow. 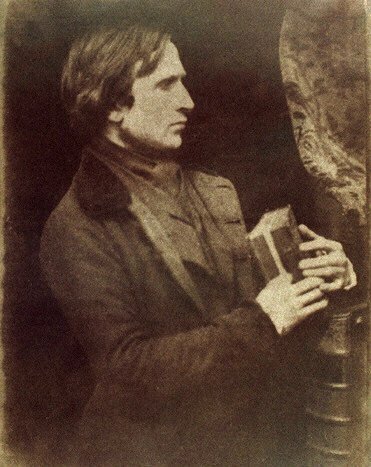 This photograph of John Cay is a calotype taken by Hill & Adamson between 1843 and 1847. George Moir was a founding member of the Edinburgh Calotype Club. Like many early photographers he was a member of the legal profession (?). Moir is pictured at full length standing at 3/4 view. His body and head are facing to the left of the frame and is located centrally. His eyes are looking out of the frame to the left. His left hand is resting under his left breast with his fingers spread and naturally his left arm bent at the elbow. His right arm is straight with his hand resting on the spine of a book which in turn is resting on a desk to the left of the frame. The book is held with the open side pointing down onto the top of the table. He is wearing a dark frock coat, white shirt and dark bow tie. His shoes are pointed and shiny. The collar of his coat is shiny (Moir may have moved during the long exposure as his coat appears to have two collars!). The desk to the left of the frame has carved legs and placed on it there is some kind of frame – this could be a frame of a painting or some kind of frame related to his photographic equipment. To the top right of the frame there is a curtain and below this there is a chair facing directly frontal. On the chair there is a large book and on top of the book there is another object which I can’t make out (another item of photographic equipment perhaps?). Lighting is from the right of the frame. 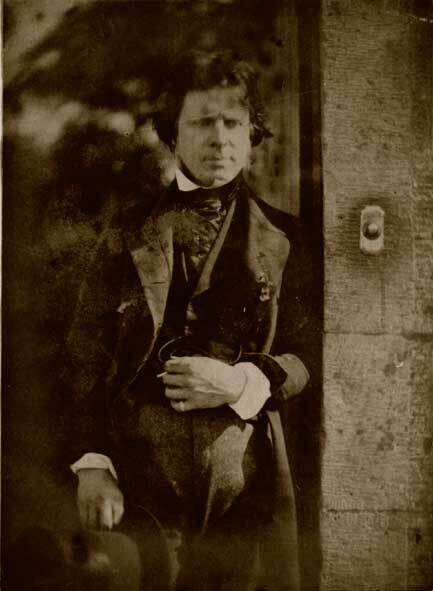 Photograph of George Moir is a calotype taken by Hill & Adamson between 1843 and 1847. James Drummond was a member of the Photographic Society of Scotland. He is pictured standing at 3/4 length. It is a 3/4 view.Drummond is resting his head in his right hand. The right arm is bent at the elbow ,which is resting on a check blanket (how this is supported is not clear). He is looking downwards towards a book supported by the fingers of his left hand. The book is closed and is also resting on the check blanket. His right leg is crossed over his left. He is slightly bent at the waist. He is wearing a light coloured suit with a long frock coat, a lighter double breasted waistcoat, white shirt and black cravat. To the bottom left of the frame there is a tall patterned vase which appears to be resting on a table. To the left and above the vase there is another contraption which I cannot make out. To the right of the frame there is the end of a trellis, which looks suspiciously like the trellis in the portrait of Cay above. Were these all studio props I wonder? Hill & Adamson between 1843 and 1847. Kenneth MacLeay is pictured in full Highland Regalia. MacLeay exhibited many photographs at exhibitions of the Photographic Society of Scotland and became a professional photographer. He is pictured at full length, 3/4 view standing against a wall. He is addressing the viewer head on although shadows make it impossible to see his eyes. His pose is jaunty. His right arm is resting on a ledge in the wall and he is holding his feathered hat in his right hand. His left hand is resting on his left hip with his right arm bent at right angles. His right leg is bent and his right foot is resting on another lower ledge. His left leg is straight. 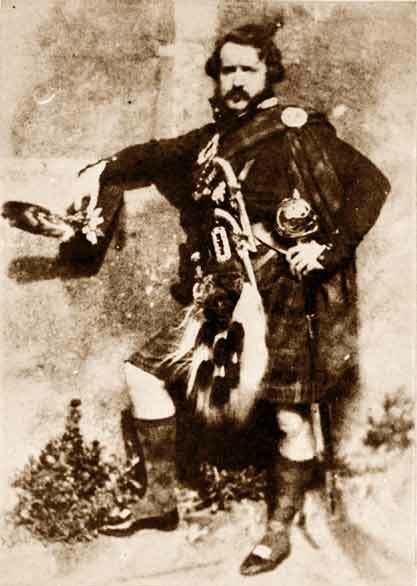 He is wearing a kilt, sporran, sash,wide belt with large buckle, and a short jacket. A sword hangs from the belt and a dirk is also in evidence. He wears long tartan socks. He cuts a splendid figure. 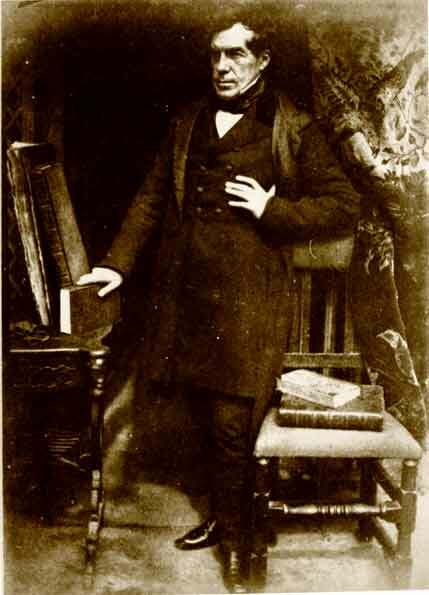 The photographs of Kenneth MacLeay above is a calotype taken by Hill & Adamson between 1843 and 1847. It is from the Edinburgh City Library collection. Thomas Rodger was a pioneering Scottish photographer. This portrait is thought to be a self portrait. 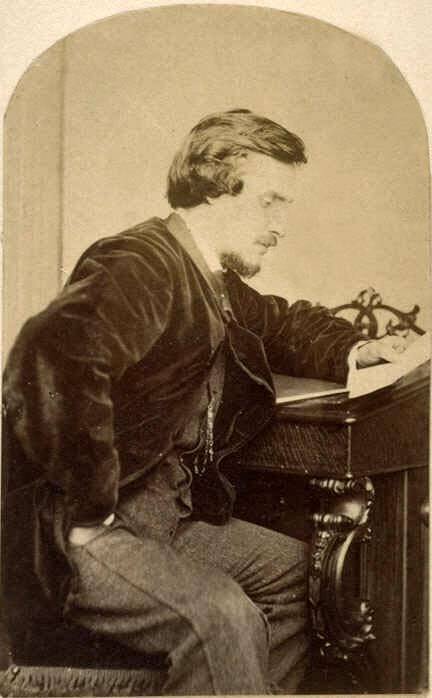 He is pictured at 3/4 length, in profile, seated at a desk. He is reading a piece of paper held in his left hand (a letter perhaps?). His left hand is resting on the desk and his right is in his right trouser pocket. He is dressed in a velvet jacket, and lighter coloured waistcoat and trousers. A watch chain hangs from his waistcoat pocket. The chair he is sitting on has tassels hanging from the seat. The desk is very substantial with carved legs and frieze. Behind the desk we can see the top of a chair, which is also very ornamental. The wall behind the desk is plain. The lighting is also plain. The top of the photograph has been trimmed to make it curved. This photograph of Thomas Rodger comes from the collection in St Andrews University Library. 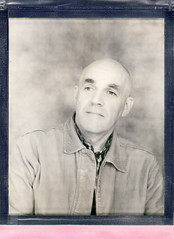 It is a photograph of Thomas Rodger, possible a self-portrait. It was taken around 1863. David Rhind is another Photographic Society of Scotland member. He is pictured seated in 3/4 view facing to the right of the frame. His right arm is resting on the arm of the chair and he is holding a pair of spectacles in his right hand. In his left hand he is holding a book and the fingers of his hand are curled under the top leaves which are bent upwards. He is wearing a dark suit,dark waistcoat, white shirt and dark bow tie. He has a watch chain hanging from his waistcoat pocket. He is staring out of the frame to the right with a fixed impassive expression. The lighting is plain. The chair appears to be made of rattan. Behind him to the bottom left of the frame is a fireplace. 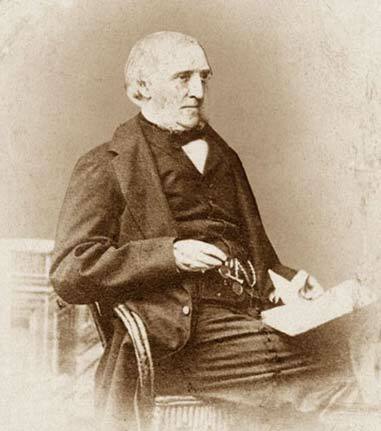 James Valentine was a founding member of the Edinburgh Photographic Society. He is pictured frontally, seated at a table. In his right hand there is a device which could be an early form of cable release, which suggests that this may be a self portrait. His left arm is bent at the elbow, which is resting on a table. His gaze is averted and he is looking out to the right of the frame. On the table is an upturned top hat. The background is plain black and lighting seems to be from high to the right of the frame. He is wearing a dark suit, darker waistcoat and trousers, white shirt and dark cravat. The table has a patterned cloth draped over it. My plan is to make a series of self portraits with my poses modelled on these old Calotypes. I will make a separate portait for each titled ‘Self portrait as David Octavius Hill’ etc. I will wear modern clothing and use modern furniture and other items as props. I intend to make my portraits with a pinhole attachment on a modern camera.By so doing I am both referencing both the historical origin of photograph, i.e. the Camera Obscura, and the continued technological development of the discipline. Photography has always been an uneasy alliance between technology and art. So am I….it will take a while. Are you going to do a portrait a day – like ‘A Day in the Life of’? I’m slightly disappointed that you’ll be all modern because I was looking forward to seeing you in all the different outfits but I know they’ll be good whatever you’re wearing..